Application for deduction of hostel fees which the college has added in my annual fees by mistake. Hostel fee is added in College fee mistakenly. I am writing to you because I would like to submit an application for deduction of hostel fees that you have added into my annual fees. As you know I have to pay the college my tuition fee annually. I have recently had a letter delivered to me with all of the cost I have to pay by the end of next month. I am shocked at the fees as normally they are lower and when I saw why it is more and usual I know why. You have added my hostel fees, By mistake. I don’t know why they have been added but I hope that it was by mistake and that you can fix it before I have to pay. I hope that you can sort this out and I look forward to hearing back your reply. We, the students of Wagner College, have collectively written this letter over a grievance we have been facing at Wagner College. Firstly, we are very grateful to attend this college and we are fortunate to have the greatest teachers and facilities in the district. Wagner College is an excellent institution and we could not be more proud of our institution. The grievance that we are writing about is that we have noticed that hostel fees are a requirement to pay for all students, regardless of whether they are living in a hostel or not. Respectfully, we do not think this is fair. We are students with limited budgets and we should not be required to pay for a facility that we have no part of. We pay a large amount of college fees per year and many of us are living within the city. This is a major inconvenience for the students who live within the city and do not require a hostel. We believe that the students that live in hostels should be required to pay this fee and not students that already live in the city. Besides this, we have no other issues. We are very proud students of this college and we only complain of grievances in order to create a better environment for everyone who is not only currently attending, but for students who will attend in the future as well. We believe this is a fair complaint and we hope that you will deduct the hostel fees from our overall college fees for students that do not live in hostels. I had been living in the college hostel from the start of year but moved out last month. I sent the email to inform the administration about it which was acknowledged. Yesterday, I received fee notification and the hostel fee was still added in the college fee. I think there is some sort of misunderstanding. I request to you please look into the issue and generate the corrected fee circular. I have attached letter of approval for leaving the hostel and my fee circular so you may confirm the information provided above. You may contact me for further clarification.I would be very grateful to you if you solve this issue of mine before fee submission due date. I hope you are doing well. I am writing this letter to you with a sincere request to please deduct the hostel fees from my college fees. As you know, that the college tuition fee is already very expensive and the hostel fee only adds to my expenses. I support myself through a part time job and pay the tuition fee and my father pays for my hostel fee. However, my father has fell very ill and his business is not doing well either. There is no one back home who can take care of the business and our family’s financial instability has hit its peak. It is my humble request to please provide an exception for me and ease my burden. I hope you will acknowledge my situation and deduct my hostel fees. Letter to mother telling her why you dislike hostel life. Letter to your mother discuss the problem of hostel life. Write a letter to your mother telling her that you dislike the life of a border. Write a letter to your mother describing your life and activities in the hostel. Write a letter to your mother telling her about your hostel life. I am writing to you because I would like to discuss with you my living situation. At the moment I am living in a hostel moving from one place to the next. I absolutely hate this life. I have no privacy and no safe place to keep my things as I have no room my belongings keep getting stolen and I don’t have much as it is. With this in mind it is very difficult to go out looking for a job and when I get a chance I have no good clothes to work in. I am telling you this because you can help. I’m not asking for money I would never but I’m asking for my old room back it will give me safety for me at night and for my things so that I can go out looking for a good job. If you do this for me when I get a job I will start to pay rent. You will give me the chance to get started. Please this is not the life for me. Hope you are doing well in strength. I’m good too. I’m writing this letter to you so that I can inform you about the hostel life. I know this is just for some years but really mom it is very difficult to live in hostel as the cook cooks tasteless food and the warden here always shouting on girls in the hostel. She didn’t even allow us to go outside the hostel. There are so many restrictions here. I want to cancel the hostel booking and request to please refund the money from hostel warden. I am writing to you because I have a hostel booking with you and due to unforeseen circumstances I need to cancel. Is it possible to get a full refund as I would not need the room now? I am writing to you because I have booked a room with you and I would like to cancel it. This is because when I did the booking I didn’t have any good relationship with my family to ask them if I could stay with them for a week. However after much talking my relationship with my sister has been fixed. This means that I can stay with her while I am in the city. I would like to have my deposit that I made on the room back. I am very sorry for the inconvenience. I will be by the hostel sometime in the next few days to pick up my money. This is to inform you that I have booked a room in your hostel, but now I want to cancel the booking as I have found a hostel near to my work place. So sorry for that, Hope you don’t mind. Application for Hostel/Hotel Guest Rooms booking for the coaches, teams and students of other universities. You can use this letter for meeting room booking, conference room booking for company or office guests as well. With respect, I want to request you to arrange a room for me for three days . I have a very important official meeting to attend and I do not expect any delay or negligence in it from you as you are managing a very reputable hotel. 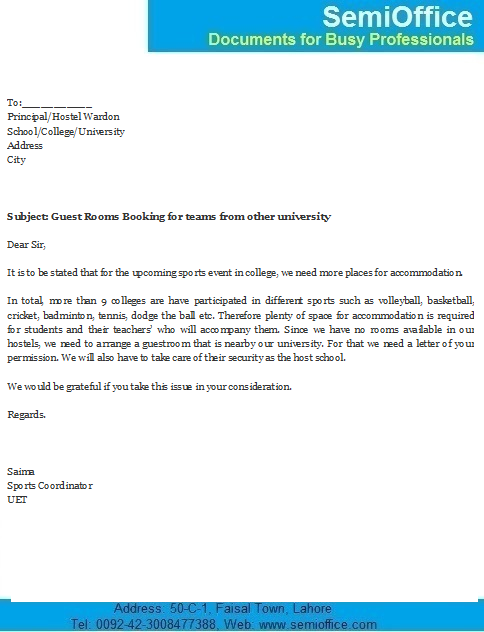 It is to be stated that for the upcoming sports event in college, we need more places for accommodation. In total, more than 9 colleges are have participated in different sports such as volleyball, basketball, cricket, badminton, tennis, dodge the ball etc. Therefore plenty of space for accommodation is required for students and their teachers’ who will accompany them. Since we have no rooms available in our hostels, we need to arrange a guestroom that is nearby our university. For that we need a letter of your permission. We will also have to take care of their security as the host school. We would be grateful if you take this issue in your consideration. I will be very grateful for your co operation. For further details you may contact me at the number given below.